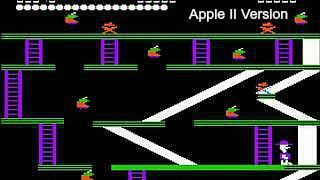 Released in 1982 by Big Five Software, and designed and programmed by Bill Hogue (he programmed many games for the Radio Shack/Tandy TRS-80 computer in the late 70s), Miner 2049er was made available for the Atari consoles and 8-bit home computers, Apple II, Commodore Vic-20, C64, Colecovision and a few other formats as listed above. However, I believe the game was never released for the Sinclair ZX Spectrum or Amstrad computers. A sequel, Bounty Bob Strikes Back (I bought this for my Atari 800XL and loved it!) was also released in 1985, although it wasn't as successful as Miner 2049er. In this challenging platform game you played the role of Bounty Bob, who's mission was to thoroughly explore an abandoned mine. As Bob walked over floor sections in the mine they would change colour. When you managed to make all of the floor sections change colour you could move on to the next level, which was even more challenging. There were many radioactive creatures to avoid and objects left behind by previous miners needed to be collected. On picking up an object the radioactive creatures would turn green and smile, allowing Bob to pick them up - a similiar idea to Pac-Man where after collecting a large power pill the ghosts would look unhappy and could then be collected. 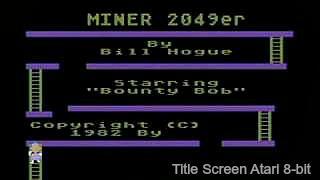 There were a total of ten different levels in Miner 2049er, and this was considered a big game in the early 80s due to limited memory in many machines. 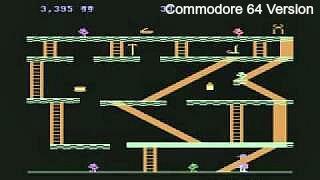 The video clip compares 13 different version of this classic 1980s platformer, so the version you played back in the day is sure to be in there somewhere. 13. Windows "Miner 2049er Again"